Atomic Web Katz accepts personal checks or PayPal for non-refundable retainers and for our services. We will contact you with the Atomic Web Katz address in Burleson, Texas if you wish to pay by check or money order. References are available upon request and will consist of clients you can contact by email or by phone. A $500 Non Refundable retainer, (or 50% of the estimated cost if below $500), and a contract for work and price, signed by both parties, is required before work begins. Billing is every two weeks during site construction and payment is expected within 14 days. Late charges will be applied. Please see sample contracts below. Your contract will be customized for your specific needs. $75 per hour for set up. Lessons at $35 per hour. Cartoons are priced by size and complication of theme. As purchaser, you will own the rights for web publishing Only. 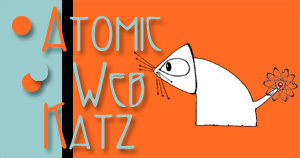 Reproduction in Any other media must be negotiated with Atomic Web Katz. Here you will find a sample contact in either .doc or pdf format. Although the basics are included, each contract is personalized for the client. This example will give you good idea of what is required.